Smart scooping or automatic scooping of the litter is one of the most desirable features in the litter boxes that are made available today. It helps to keep the litter clean and also allows the pet to use the litter box easily so that there is no difficulty in training the pet. ​The Our Pet’s Smart Scoop Automatic cat litter box has the capability to rake the litter on time for clean litter management and also helps in tidying up the box for the next use. ​The cat litter bo﻿﻿x provides a scoop free litter removal with the help of an automatic raking system that allows the litter to clump within a period of 15 minutes and then carries it to a disposal bag to make sure it can be disposed of later. ​The litter box has high-grade and efficient functions and features allowing the pet owner enjoy an easy removal of the litter in a safe manner. The box has been designed to make sure that the rake will move smoothly so that no litter clumps are left behind and it gets removed quickly. ​​The who setup is backed by an electric mechanism that produces no considerable sounds or noises hence provides a smooth and quiet functioning for a disturbance-free environment. You can keep it anywhere in your house with no mess or noises around you. ​Though it has a compact design, it still has a spacious litter cavity to allow any cat having a bulky or average body size. Due to sufficient space, the litter stays inside and does not cause any mess on the floor. ​​This open-head litter box can be used by one or more cat at home. You just need to keep it well maintained for quality results. ​​The litter box has a well-designed structure that does not need extra-large or specialized setup for easy usage. Rather, you can place it anywhere you need it or where you think you cat finds it comfortable. Due to quick cleaning and odor free litter handling, you will be experiencing a clean and odor free environment because the litter is disposed of right after the cat leaves the box. You will never see the dirt and also never feel any smell around your home. Easy usage makes it even more favorable for most of the cat owners. It does not need any special settings and can be placed with just a switch nearby and it will work as prescribed. The disposed litter is kept in a disposal compartment or bag that can be removed when needed or you can replace once a week or it may need frequent change if you have more than one cat in your home. Sensible functions make it a smart choice as it starts its cleaning cycle based on the time when the cat enters it, the system senses the presence of the cat and starts the cycle right after it leaves the box. It allows 15 minutes for the clumping process to complete and then remove the lumps to the waste bag. All the process is done without any manual handling and keep you away from any such tasks. Specialized rake is designed to make sure that no clumped litter is left behind and the raking process removes all dirt easily. The spacious litter box allows the cat to use it easily and also make it sure that the litter stays in the box. Great for multiple cats with a little frequent removal of the disposal bags. You may need to buy a no stick spray for your box to keep it away from sticking dirt clumps on the floor of the container. ​​It has been rated as a good litter box when you need one for your 1 or two cats at home but it may show some issues in the raking process after a few months usage. 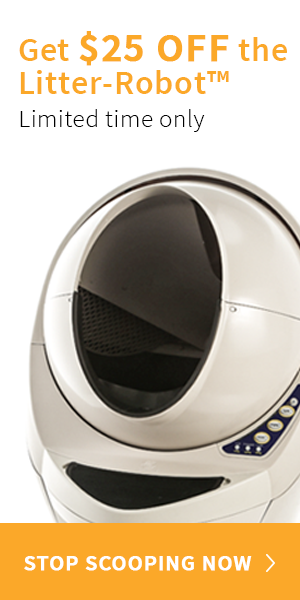 Still, on the basis of its features and performance, it can be considered as a good option for cats litter disposal.